Using Chandra and several other telescopes, astronomers have found the most distant galaxy cluster to date. This cluster, called CL J1001+0220, lies about 11.1 billion light years from Earth. Chandra and the other telescopes may have captured this cluster at an important stage never seen before. 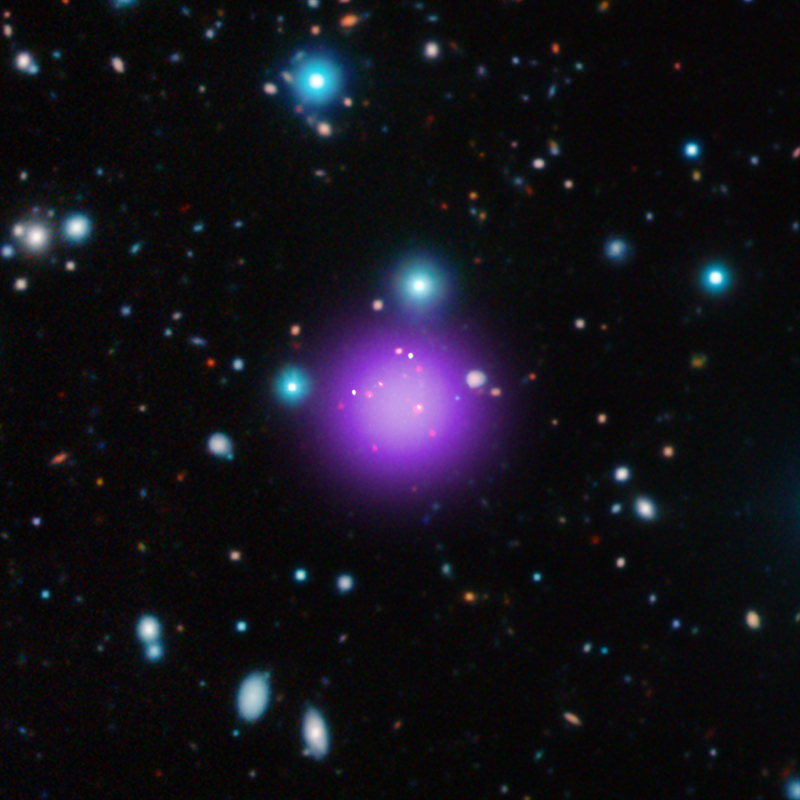 The remote galaxy cluster was found in data from the COSMOS survey, a project that observes the same patch of sky in many different kinds of light ranging from radio waves to X-rays. This composite shows CL J1001+0220 (CL J1001, for short) in X-rays from Chandra (purple), infrared data from ESO's UltraVISTA survey (red, green, and blue), and radio waves from the Atacama Large Millimeter/submillimeter Array (ALMA) (green). The diffuse X-ray emission comes from a large amount of hot gas, one of the defining elements of a galaxy cluster, as described in the press release. In addition to its extraordinary distance, CL J1001 is remarkable because of its high levels of star formation in galaxies near the center of the cluster. Within about 250,000 light years of the center of the cluster (its core), eleven massive galaxies are found and nine of those display high rates of formation. Specifically, stars are forming in the cluster core at a rate equivalent to about 3,400 Suns per year. The large amount of growth through star formation in the galaxies in CL J1001 distinguishes it from other galaxy clusters found at distances of about 10 billion light years and closer, where little growth is occurring. These results suggest that elliptical galaxies in clusters may form their stars through more violent and shorter bursts of star formation than elliptical galaxies outside clusters. The latest study shows that CL 1001 galaxy cluster may be undergoing a transformation from a galaxy cluster that is still forming, known as a "protocluster," to a mature one. Astronomers have never found a galaxy cluster at this precise stage. These results may also imply that star formation slows down in large galaxies within clusters after the galaxies have already come together during the development of a galaxy cluster. A paper describing these results appeared in The Astrophysical Journal on August 30, 2016 and is available online. The authors were Tao Wang (French Alternative Energies and Atomic Energy Commission, or CEA), David Elbaz (CEA), Emanuele Daddi (CEA), Alexis Finoguenov (University of Helsinki), Daizhong Liu (Purple Mountain Observatory, China), Veronica Strazzullo (Ludwig Maximillian University of Munich), Francesco Valentino (CEA), Remco van der Burg (CEA), Anita Zanella (CEA), Laure Ciesla (CEA), Raphael Gobat (Korean Institute for Advanced Study), Amandine Le Brun (CEA), Maurillio Pannella (Ludwig Maximillian University), Mark Sargent (University of Sussex), Xinwen Shu (Anhui Normal University), Qinghua Tan (University of Helsinki), Nico Cappelluti (Yale), and Yanxia Li (University of Hawaii). Coordinates (J2000) RA 10h 00m 56.96s | Dec 02° 20´ 09.32"
About 11.1 billion light years from Earth. Combines X-rays from Chandra X-ray Observatory, infrared data from ESO's UltraVISTA and radio waves from ALMA. About 4.36 million light years across. X-rays are purple, infrared is red, green and blue and radio green.